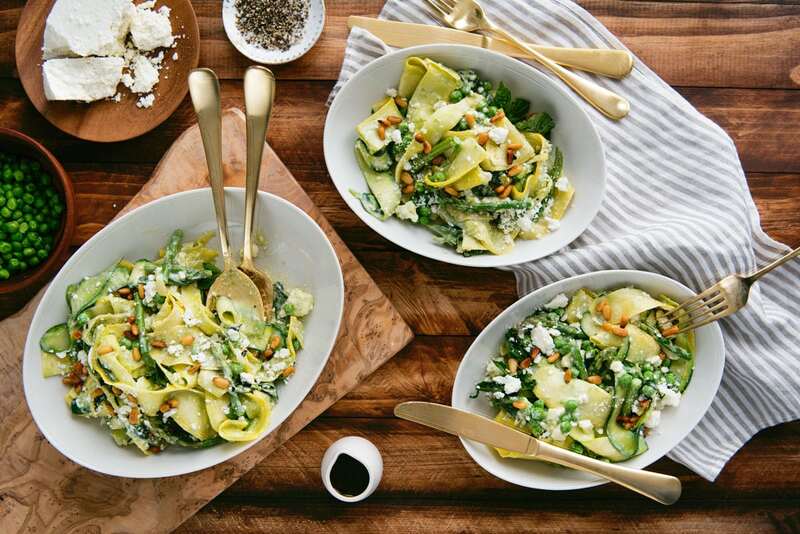 A beautiful and healthy Spring Zucchini Noodle Pasta Recipe with Asparagus, Peas and Feta, plus how to make zoodles without a spiralizer. 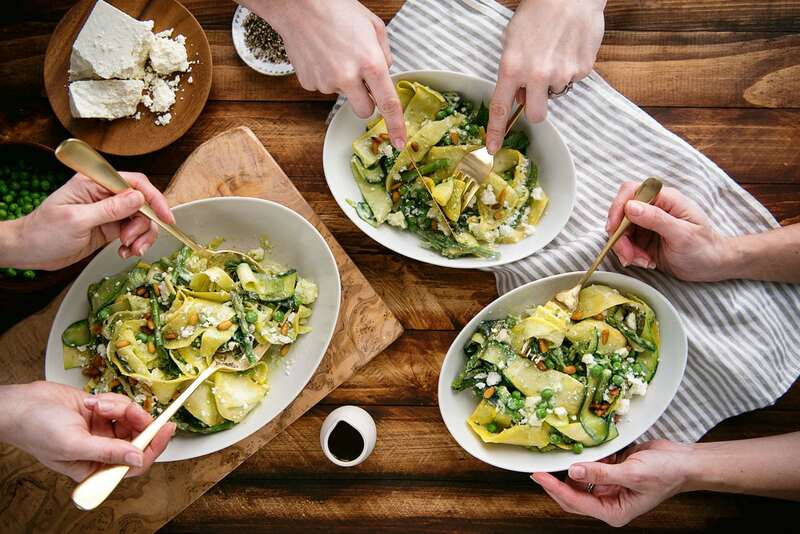 ‘Zoodles’ is such a funny word for what are actually zucchini thinly sliced into delicious ribbons that mimic fettuccini pasta. Spring is the perfect time to add, or replace, your pasta with zoodles. 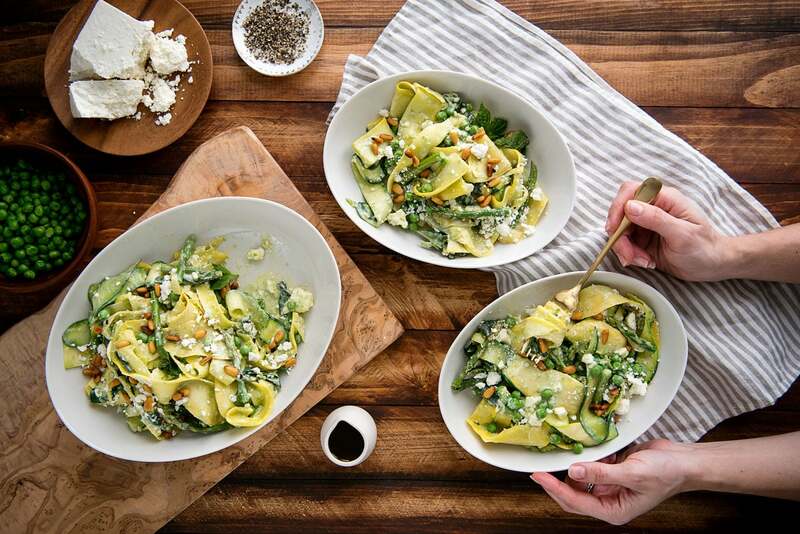 It’s one of those easy swaps to make a recipe healthier, and when done right, you won’t even miss your traditional pasta! Lightly cooked, they have a texture and taste similar to noodles. 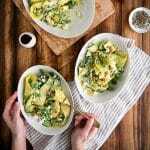 For this recipe, you can make summer squash and zucchini noodles without a spiralizer. To make the gorgeous supple ribbons you see in these photos, use a mandolin slicer. Mandolin slicers are super cheap and so useful! I highly recommend adding one to your cooking routine. They save time and elevate vegetables to things of beauty.A vegetable peeler will also work, you’ll just get thicker noodles. If you want to use a spiralizer, by all means, that will work fine too. The recipe is based on a recipe by the famous Israeli chef, Ottolenghi. The dish will be a truly stunning addition to your spring dinner table. The yogurt pasta sauce is bright and fresh, and so much healthier than adding heavy cream. It also keeps the recipe feeling light, and almost delicate. Credit for the idea to use zoodles goes to one of my favorite food blogs, The Year in Food. 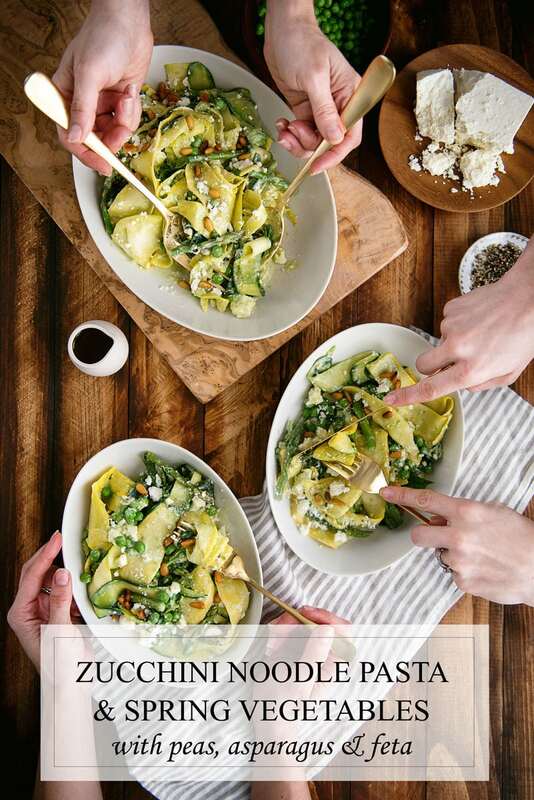 It’s such a great swap and has me dreaming of what other recipes I can add zucchini noodles to. In a food processor, combine the yogurt, 2/3 cups peas, and 1/4 cup of olive oil. Pulse until combined and set aside. 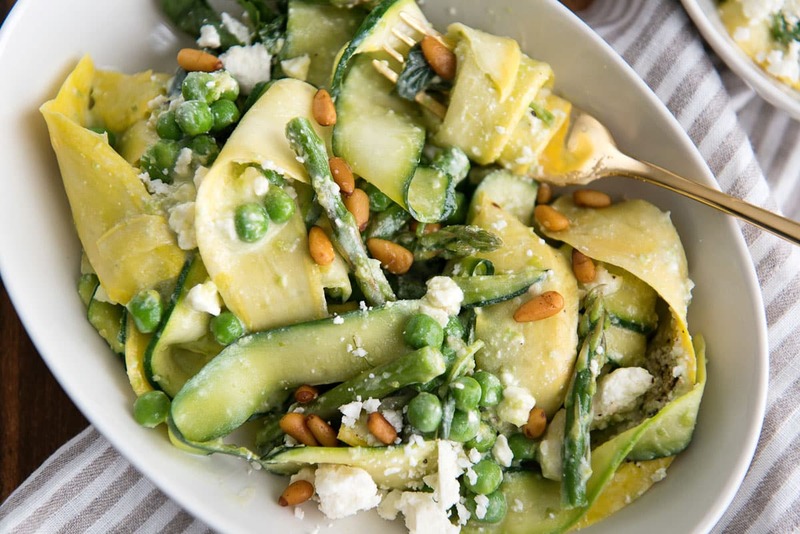 Use a mandolin slicer or a regular vegetable peeler to slice the zucchini and summer squash into long thin strips. Work around the squash as you make your way inwards. Stop when the texture starts to change and you start to see seeds. Warm two tablespoons of olive oil in a large saucepan over medium-low heat. Working in batches, sauté the zucchini and summer squash ribbons until just soft, about 3 to 4 minutes, stirring occasionally. Meanwhile, warm the remaining two tablespoons of olive oil in a small skillet over medium heat. Add the pine nuts and red pepper flakes. Cook, stirring frequently, until the pine nuts are golden brown, about 4 minutes. Set aside. Toss the squash pasta and yogurt sauce in a large mixing bowl. Add the remaining peas, basil, Feta, and toasted pine nuts. Add fresh cracked pepper and 1/2 to 1 teaspoon of sea salt, to taste. Gently toss and serve immediately.